If you do a lot of wheel changes for Autocross or for frequent seasonal tire changes, this kit is a must have. Having studs instead of traditional lugs makes aligning wheels to the rotor a cinch. No more struggling with the weight of the wheel while trying to line up a single lug bolt so you can relax! Overall stud length is 2.25" with an allen head and a thread diameter of 12mm which is for all pre-July 2006 MINIs. The insert side is 1/2" which 'bottoms' out into the hub/rotor. Comes with 19mm head nuts. 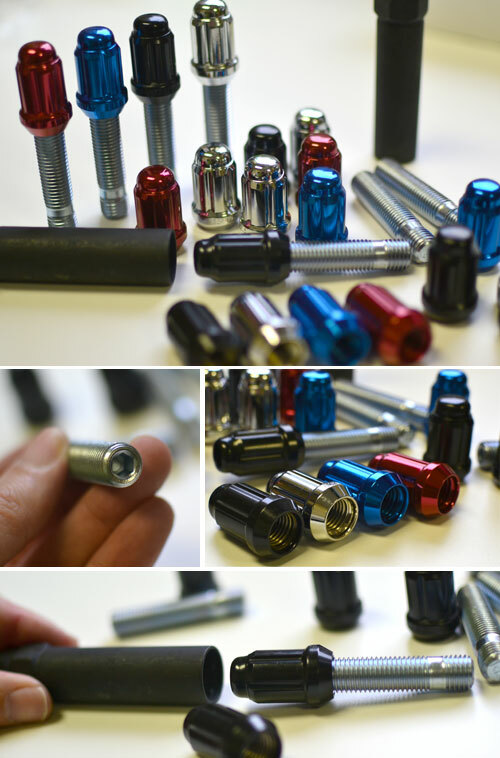 Kit includes 16 studs and 16 thin wall nuts. Ships with special thin wall socket to mate to tuner nuts. In August of 2006 MINI switched to a 14mmx1.25 lug. Older cars use a 12x1.5. We also offer a M14 stud kit (see exterior/wheels+misc section).